Union Square is an important and historic intersection and surrounding neighborhood in Manhattan, New York City, located where Broadway and the former Bowery Road – now Fourth Avenue – came together in the early 19th century; its name celebrates neither the Federal union of the United States nor labor unions but rather denotes that "here was the union of the two principal thoroughfares of the island" The current Union Square Park is bounded by 14th Street on the south, Union Square West on the west side, 17th Street on the north, and on the east Union Square East, which links together Broadway and Park Avenue South to Fourth Avenue and the continuation of Broadway. The park is under the aegis of the New York City Department of Parks and Recreation. 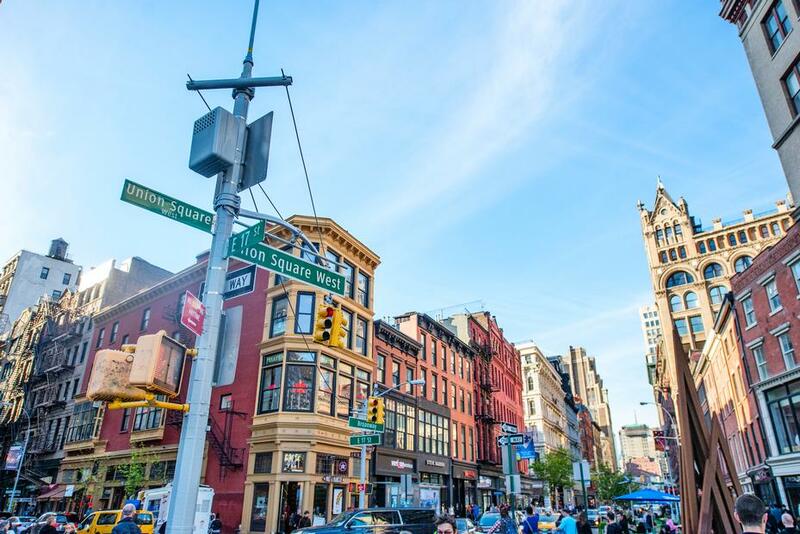 Adjacent neighborhoods are the Flatiron District to the north, Chelsea to the west,Greenwich Village to the southwest, East Village to the southeast, and Gramercy Park to the east. Strand Bookstore: New York City booklovers treasure trove - home to 18 miles of books. New books, used books, rare books, out of print books, art books, any kinds of books you can think about! Webster Hall – A venue and a nightclub, it is located in the heart of Union Square. Webster Hall is the host to many events and concerts all year round. Webster Hall boasts three live performance venues under one roof: the world-famous Grand Ballroom, the Marlin Room and The Studio. Union Square Park (14th to 17th St, Park Ave S)– right in the middle of the City, lots of history and statues, a new expanded 15,000-square-foot playground opened 2009, free Wi-Fi outdoors, and surrounded by hundreds of shops and restaurants. Pete’s Tavern (129 E 18th, Irving Place) – opened in 1864, classic NYC Tavern with history, burgers and beer. Featured in dozens of TV Shows and Movies and where O. Henry wrote the Gift of The Magi.